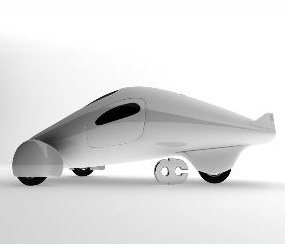 Three San Diego engineers have designed a two-passanger, three-wheeled diesel-electric parallel hybrid that will achieve a phenomenal 330 mpg while selling for less than $20,000 (USD). The engineers have formed a company, Accelerated Composites, LLC, (AC) to refine the design and build a prototype. 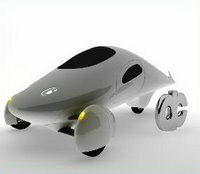 According to a press release, the innovative vehicle, dubbed the "Aptera," will be constructed from composite, light-weight materials, will post this fuel efficiency in normal city and highway driving and will demonstrate acceleration and handling similar to that of a Honda Insight. The vehicle achieves these remarkable numbers through the use of cutting-edge materials, manufacturing methods, and a maverick design mantra. AC's slogan is "Innovation in Orders of Magnitude" and seems appropriate considering the reported specs of the Aptera. So why aren’t the auto makers switching? “Cost” says Fambro. "They haven’t figured out cost-effective manufacturing processes for composites. But we have." The Aptera will weigh only 850 pounds and, as mentioned above, is made almost entirely of lightweight composites, based on AC’s Panelized Automated Composite Construction (PAC2) process. 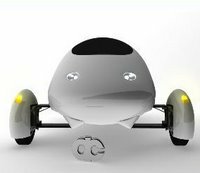 The light weight and three-wheel design means the Aptera will be liscenced as a motorcycle. 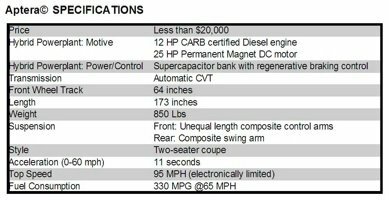 The production model of the vehicle will pair a 12 horsepower (hp) CARB-certified diesel engine with a 25 hp permanent magnet electric motor and will be able to run in all-electric mode (AC is designing the prototype with a gasoline engine for cost). AC plans to use ultracapacitors for energy storage and regenerative breaking. Ultracaps are not chemical batteries and thus can quickly and efficiently accept the energy from regenerative breaking. They also offer very high power densities (albeit with correspondingly low energy densities). The Aptera will feature an automatic continuously variable transmission (CVT) and will be able to accelerate from 0-60 in 11 seconds with a electronically regulated top speed of 95 mph. To increase aerodynamics, the slippery vehicle will not have side mirrors but will rather incorporate video cameras and a rear view display inside the vehicle. All told, the aerodynamics of the Aptera are practically an order of magnitude better than anything on the road today and AC claims that the coefficient of drag on the vehicle will be only 0.055-0.06. The initial response by many to this design (myself not exluded, see lengthy discussions here and here) is that it could never pass safety standards or that it is too unsafe to drive on the same roads as SUVs and semis. "The Aptera will be treated as a motorcycle in the eyes of the law, but that doesn't mean it's unsafe. On the contrary, it will have the same type of airbag-in-seatbelt technology used in newer light planes. Additionally, the dirver and passenger sit in a 'crashbox' thats underneath the aeroshell...or body. There's crushable/absorbing material between the aeroshell and body as well. The crashbox design, still being modeled and simulated, offers much more protection than most car doors/pillars." Furthermore, while composites may be light, they aren't brittle and actually have strengths similar to steel. In short, we're not talking about a fiberglass tin can here, but rather a composite shelled vehicle with an inner crashbox modeled after those used by forumala race cars, a crushable/absorbing material and airbags protecting the driver and passanger. So while you're car may be totalled in an accident with an SUV, you'll walk away fine (can the SUV driver say the same? Furthermore, millions of people the world over ride motorcycles while plenty of us treehuggers feel safe enough riding your bikes everywhere. Why wouldn't you feel safe enough to ride around in a vehicle surrounded by a composite shell and protected by a 'crash box' modeled after those in a formula racer? (We've all seen those spectacular high-speed, end-over-end race car crashes from which the driver walks away a bit bruised but otherwise unhurt). Finally, plenty of people got excited about the Honda Insight and I can't imagine that the Aptera is any less safe than the Insight which is about the same size and made of similar ultra-light materials. In the end, the most exciting part about this vehicle is that it pushes the limits of what we think is possible for a vehicle to obtain. 330 mpg! How can we get excited about GM's 70 mpg boxfish-styled diesel concept (also with video instead of side mirrors for aerodynamics) when this baby is out there? Even if this vehicle never makes it on the roads (and I dearly hope it does), or if when it does, it only gets 150 mpg or some such, it will still be a testament to what is truly possible when you are willing to innovate and to let form follow function. The designers at Accelerated Composites have moved the goal posts and pushed the edges of what we thought was possible and I hope that their design serves to inspire vehicle designers elsewhere to imagine what else might be possible, to truly innovate, and to begin designing the cars of tomorrow today. Depending upon the completion of funding, a prototype could be ready to roll as early as the end of March or April, according to Steve Fambro. Jessi, I agree with you totally on the safety aspects. In my interview with Steve Frambo he made this point very clear. One aspect of the car that is not clear in the artists rendition is that there are bumpers on the front and rear that are molded into the body. See my postfor my paragraph on safety. And to everyone else, I certainly recommend checking out Jim's post on the Aptera (and indeed his whole blog). He did a personal interview with Steve Frambo and turned up some additional info. Great find, Jesse. This is more like it. something hopeful to think about. How will it do in a New England winter? Don't have to worry about those anymore. With the global climate change the winters wont be the same.